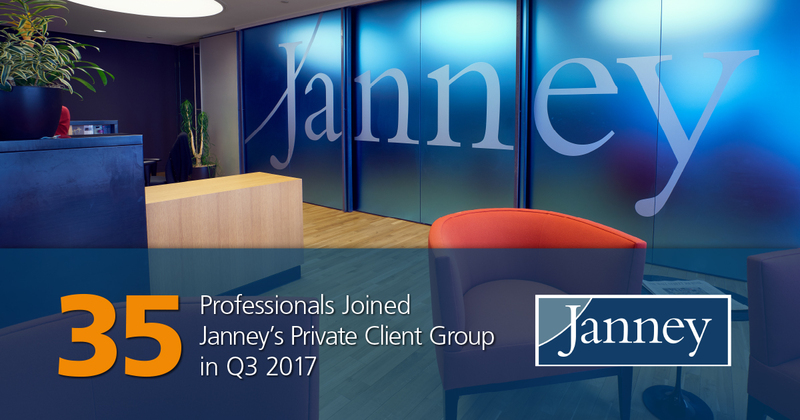 Philadelphia, PA – October 5, 2017 – Janney Montgomery Scott LLC (“Janney”), a leading full-service wealth management, capital markets, and asset management firm headquartered in Philadelphia, PA, welcomed 35 professionals to its Private Client Group in the third quarter of 2017. This includes 23 experienced Financial Advisors, entrusted to manage over $2.2 billion in client assets, three Account Executives, and nine Private Client Assistants. Janney also opened two new branches in the third quarter in Franklin, TN and Miami, FL. Janney has over $73.5 billion in assets under management as of September 30, 2017. Year to date, Janney has welcomed 68 new Private Client Group members, of which 45 are financial advisors, and opened three new office locations, including Goldsboro, NC. Janney provides advice to individual, corporate, and institutional clients. Our expertise includes guidance about asset management, corporate and public finance, equity and fixed income investing, equity research, institutional equity and fixed income sales and trading, investment strategy, financial planning, mergers and acquisitions, public and private capital raising, portfolio management, retirement and income planning, and wealth management. Janney is an independently-operated subsidiary of The Penn Mutual Life Insurance Company and is a member of the Financial Industry Regulatory Authority (FINRA), and Securities Investor Protection Corporation (SIPC). Additional company information is available at www.janney.com. © 2017 Janney Montgomery Scott LLC. All Rights Reserved.